Choose keywords to fit your business needs. Have all your research gathered and displayed in an easy-to-read table. The special SEMrush algorithm will suggest keywords semantically related to your initial search and sort them into groups by search topic. This allows you to instantly find the right keywords for your campaigns. This is an excellent opportunity to build long-tail keywords and create keyword-rich content that will boost your rankings in Google. 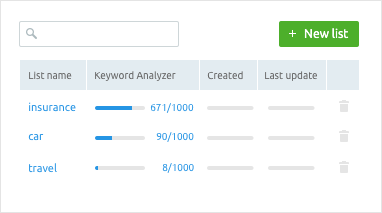 You can send up to 1,000 of your favourite keywords to Keyword Analyzer as you go. The tool will compile all of them in one handy listing with an indication of their search volume, keyword difficulty, top competitors and other useful metrics. You can also estimate how much traffic these keywords will bring to your website by looking at their click potential. Most of the metrics are available in real-time and can be updated with one click. Export your findings to other SEMrush tools to be able to track your selected keywords’ performance in organic and paid results. Send your newly created keyword list to SEMrush Position Tracking - a service made specifically for tracking your website’s rankings for your target keywords in the Google Top 100 organic and paid results. The tool also allows you to integrate your keywords with the SEMrush PPC Keyword Tool that will help you build a successful PPC campaign. When working on the optimization of several websites at a time, or several individual pages within a website, having separate target keyword lists is extremely handy. See how you can organize your workflow across multiple projects by creating up to 50 target keyword lists and assigning them to each individual client, website, website page or topic.